It’s always a great time to buy gifts for any gardeners out there that cannot wait to get their hands dirty for the upcoming season. There’s countless gifts you can get a gardener, from practical tools that will help make a job easier to attractive decorations that enhance the style of the garden, so it should’t be hard to find a gift for anyone with green fingers! Gardening can be tiresome work, especially with all the kneeling and bending over you do, which is why the Songmics Kneeler Seat is a great gift idea for any gardener. The cushioned seat can be used for sitting or kneeling, while there’s a handy pouch for storing tools too! It’s perfect for avoiding unnecessary aches and pains from a long days gardening, making it an especially appealing gift for any older gardeners! These teacup planters offer a nice alternative to boring plant pots. Each planter is handmade from willow and features an attractive and fun teacup design (with saucer included! ), which will certainly work as an eye-catching piece in any garden. If there is one thing that a gardener could always use, it’s a new set of tools! This nine-piece tool set comes with a selection of 5 stainless steel tools, pruners, protective gloves, and a roll of plant twits tie -everything a gardener needs to get started! If you know someone that has just moved into a new house and needs some basic garden tools, this is a great gift idea! A gardener can only be as good as the tools they use, and every good gardener needs a pruning saw! This 7-inch blade is made from premium materials to ensure that it can easily saw and prune those peskier plants and trees branches. It features an ergonomically designed handle grip that combines with the quality blade to make pruning a simple task. Every garden needs a bird feeder, as it attracts a host of beautiful little birds that will leave the garden teeming with life. This cast iron bird feeder comes with a cute design, shaped to form a heart and coming with a vintage finish that makes it look like a timeless piece of outdoor décor – this looks perfect hanging from a tree! A fantastic gift idea for both garden and bird lovers! This unique bird feeder is an amazing gift for gardeners that love birds in their garden, as it allows you to view them feeding from mere inches away! The transparent feeder easily attaches to a window using suction cups, and then it’s a case of filling it with feed and watching the birds flock to it. Before long, gardeners can expect to view cardinals, chickadees, and other small birds feeding away inside this amazing crystal clear bird feeder. Unfortunately, not all gardeners enjoy the same space and freedom as others, especially those living in urban areas. Should you know someone in this situation, then a copy of the RHS Urban Gardener is a fantastic gift idea. Authored by garden designers Matter James, it details and explores various garden ideas for urban locations that are constricted by size and space. It’s packed with great ideas for creating inspiring garden features even with limited space. Every gardener should have a fine pair of secateurs, which is exactly what you will find with this quality set. The specially designed ratchet mechanism is perfectly suited for those with weaker grips or deal with hand aches, making them far easier for cutting and pruning. From thick tree branches to simple flower blossoms, these versatile secateurs will make any pruning that much easier, so they are certainly a fine gift for senior gardeners. Potting all your plants and flowers for the upcoming season is long and messy work – unless you have a fantastic potting table such as this beautiful product! Not only a stylish piece that looks great in any outdoor area, it is also a practical space for prepping and potting all your plants and flowers while keeping mess to a minimum. Fitted wheels make it easy to move around the garden, while a potting tray, shelves, and drawers makes it the perfect prepping station that any gardener will love. Raised flower beds and vegetable gardens looks fantastic and are very useful growing spaces, making them a fine addition to any garden. However, building them is far from simple, so sometimes it’s just easier to buy them instead! This flat packed wooden raised border can be easily assembled and offers a great spot for growing vegetables, flowers, and plants with minimal fuss. The awesome Miracle-Gro AeroGarden Bounty is an incredible piece of tech that any gardener will adore. Why? Because it can let you grow herbs and plants indoors throughout the entire year! Featuring a 45-Watt LED extendable lighting system, plants grow at five times the speed using this 9-pod indoor garden – without the need for any soil! It even comes with an interactive touch screen that provides ample information to ensure your plants remain healthy, including when to water, automatic lighting, and other tips and info to help your plants flourish. This is a seriously cool piece of indoor growing equipment – perfect for a gardener lacking space to grow plants! A greenhouse allows gardeners to grow plants that they would not normally be able to due to weather conditions, but these are quite expensive investments that not everyone can afford. This Oypla 3-Tier 4 Shelf Mini Walk-in Growhouse is the perfect solution to such a problem, offering an affordable PVC greenhouse that is perfect for a variety of garden tasks, including germinating seems, growing seedlings, root cuttings, and other plants. This is a gorgeous planter that adds some serious style to any garden space. Being made from plastic makes it very durable and virtually impervious to decay, meaning it will last for as long as the gardener wants it to! A planting depth of 28cm allows for a wide selection of plants, herbs, or flowers to be potted in this lovely decorative piece. What better gift for a gardener than a ridiculously comfortable outdoor hammock? It’s an attractive piece that will look amazing on a patio or anywhere else in the garden, and it’s built to withstand heavy weights and even the worst weather conditions. You can be sure any garden lover with adore swinging away in the hammock on a cool summers day – it may be difficult to stay awake it is that comfortable!! Looking for that next-level gift for a gardener? 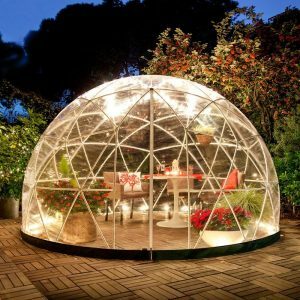 Then look no further than the incredible Garden Igloo 360 Dome – it is one seriously impressive piece of garden hardware! It’s a portable dome that can sit in any outside area and completely transform it. It has many functions, be it as a greenhouse, conservatory, gazebo, kids play space, or even for storing stuff! Setting it up is very simple, and it offers a great way to sit outdoors even if the weather isnt the best! This will be the talking point any many BBQ and garden parties, and there’s not a gardener out there that won’t appreciate such a luxurious addition to their garden. A garden isnt really complete without at least one garden gnome – it’s a long-standing tradition after all! Well, now you can buy that perfect gnome gift with this adorable Thumbs Up Garden Ninja Gnome. 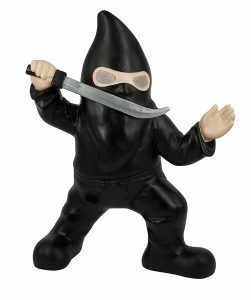 A hilarious take on the classic garden gnome, the ninja comes with light-up eyes for a cool aesthetic during the evening time, although it will look just as good during the day! If you know a gardener that grows their own fruit, then this is a very cool yet unique gift that also works as a decorative piece. Many local wines and ciders throughout regional areas in France still use a traditional fruit press such as this one to make fresh wine and cider. Of course, that takes a fair amount of time to make, but you can still make some delicious fresh fruit juice using the press, which is surprisingly easy to operate. That’s not to say it can’t be used to produce some homemade cider either! Weeds are the eternal enemy of any gardener, so if you want to buy them a gift they will appreciate and get plenty of use out of, then it is the fantastic GardenWeeder. It’s a very useful tool that features long claws for reaching deep down into the soil to grab weeds such as dandelions and thistles right at the root. It also aerates the soil after removing the weed for a healthier lawn. This is a stunning decorative clock that will look beautiful in any outdoor setting, making it a great option for the more style-savvy gardener. The floral and bird design is very attractive, which is nicely complimented by the clock, thermometer, and hygrometer combination. All in all, a very attractive piece with some useful functions for the gardener that loves to spend plenty of time sitting outdoors. Who needs an old-fashioned wheelbarrow when you can enjoy a modern take on the classic piece of garden equipment, which is exactly what you get with this garden tipping cart. It is very useful for transporting flowers, compost, soil, mulch, garden waste, tools and pretty much anything that needs to get moved around the garden! Durable materials will ensure it lasts a lifetime, while a spacious cart will make transporting stuff throughout a garden that bit easier. Some gardeners have large areas that require watering, fertilisers, pesticides, and insecticides, which can be a big nuisance without proper equipment like a pressure sprayer. This 5L model from Spear & Jackson will make this a thing of the past, offering a massive tank and nozzle for easy application of water or water-soluble products for a healthier garden. This is a fantastic gift for any budding gardeners looking to grow their first vegetables by offering a selection of seeds and all the necessary equipment for growing them. It includes seeds, planting pots and trays, compost, and easy-to-follow instructions for growing each type of veg, allowing any gardener to get their vegetable patch started in no time at all.